Scanair water chillers are designed in wide range from 1 TR to 50TR, there will be a hot water tank in our system from where the water is being pumped through the evaporator, gets cooled to the required temperature and sent to the user department. There will be a temperature indicating controller which controls the temperature of the chilled water. The system working is controlled by the set point of the temperature controller to stabilize the chilled water generated to the required level. Fresh water is used freely for cooling production processes. Today, most processes require cooling water with much closer defined tolerances. Water chillers provide cooling in a controlled closed circuit. This means that the water used for your production processes is reliable, constant, and defined. Scanair Water chillers will maintain the temperature range from 5˚ C To 30˚ C ± 1˚ C capacity from 450 Kcal/Hr to 150000 Kcal/Hr, 3 LPM to 650 LPM with different flow capacity. Water or other liquid from the chiller is pumped through process or industrial equipment specially for the plastics industry uses process chillers to reduce cycle times in injection molding and blow molding by regulating temperatures. The most common way of permanently joining metal parts where heat is applied to permanently fuse pieces of metal together. For some pieces of welding equipment, heat needs to be removed from the welding heat to preserve the integrity of parts of the head. Depending on the heat removal a Scanair portable chiller series is a good choice or since precise control and can provide sufficient cooling. Lots of flow at high heat loads. Small TIG or MIG welders consume 2-3 kilowatts. Precise temperature control is not important. When metals are cut the friction causes heat to build-up in the recirculated cutting oil. By controlling the cutting fluid temperature greater accuracy can be achieved because thermal expansion and contraction of the material is eliminated. Always use a liquid heat exchanger with one path for the cutting oil and the other path for the chiller. 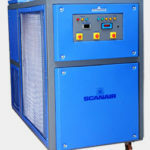 Scanair Chillers are ideal and most suitable for a wide spectrum of applications in industries like, Plastic Injection Molding and extrusion, Pet Blowing, Film Blowing HDPE, LDPE, Pouch sealing Machines, Lamination Machines, Aluminum Die Casting, Laser Welding, Ultra sonic Welding, Induction Hardening Machine etc., those applications need to be cooled to a precise temperature to reduce the cycle time and product quality, productivity. 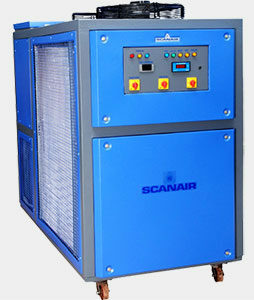 Scanair chillers are designed new generation styled.